LG Appliance Parts - Hard to find Replacement Parts- CLICK HERE! Recently I had some problems with my LG Side by Side Refrigerator and did a search for LG parts and found it practically impossible to find what I was looking for to fix my fridge. I found out that many appliance part stores still call the brand Goldstar. Goldstar actually merged with a company called Lucky and thus the acronym LG came to be. In any case, I found the search on this site: LG Appliance Parts to be very helpful in my quest to fix my own refrigerator without having to call an expensive handyman in. Don’t laugh but basically, my refrigerator light bulb burned out. Changing out a refrigerator lightbulb is not a difficult process for most people .. but I had a bit of trouble finding the light bulb until I found Appliance Life - www.appliancelife.com. In some cases, if the light bulb burns out often, you may have a problem with the door switch. Depending on the refrigerator model, there should be a button or sensor in the refrigerator door which can turn the light bulb on and off. If this button or switch is not working properly, the light may stay on or off permanently. Once you’ve located the mechanism, try to manipulate it to the on and off positions. If the light still does not respond, then you’ll need to have a qualified serviceman investigate the switch and the internal wiring. Make sure you do not exceed the recommended wattage of a refrigerator lightbulb - thus always buy a light bulb that is specifically made for your refrigerator ie.. Refrigerator Replacement Parts. Using standard room lighting bulbs rated over 40 watts is not energy efficient and probably dangerous. Bulbs designed especially for refrigerators are made to withstand changes in temperature and moisture condensation. Other bulbs may be too thin or have hot spots which may cause shattering when wet. You can find many other LG appliance parts at Appliance Life. They also have instructions on finding model numbers and even links to diagrams that will help you. The Motto they boast is that the will save you money by “Extending the Life of your Home Appliances” and we do agree! Reminder: Whirpool Over The Range Microwave Hood Combination- CLICK HERE! Important Safety Notice -- Fire hazard, do not use microwave. In cooperation with the U.S. Consumer Product Safety Commission (CPSC), Whirlpool Corporation, of Benton Harbor, Mich., is voluntarily recalling about 1,800,000 Whirlpool, KitchenAid and Kenmore brand "over the range" microwave-hood combinations. The recall does not include countertop microwaves. Use of the microwave-hood unit poses a risk of fire, which could cause personal injury or property damage. This recall involves Whirlpool, KitchenAid and Kenmore brand microwave-hood units with serial numbers that begin with XC. The serial numbers, as well as the model number, can be found on a label on the bottom edge of the food cavity, inside the microwave door. Department, mass merchandise and appliance stores, as well as builders and re-modelers sold the microwave-hood units nationwide from January 1998 through September 2001 for between $249 and $749. Consumers with recalled microwave-hood units must immediately stop using the unit and disconnect the unit by unplugging it. Every potential user of the unit should be informed of the risk of fire and told not to use the microwave. Appliance Life has gone social with Google's Friend Connect- CLICK HERE! Everyone knows that there isn't anything much better than a good handyman or handywoman friend when you are trying to repair an appliance. If we look back at the last 2 years of suggestions and comments from our loyal visitors, the number one suggestion that we receive is to have immediate access to a community of people that "know" about appliances. 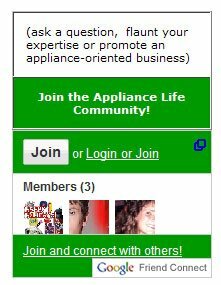 With that prelude, we at http://www.appliancelife.com/ are proud to announce the integration of Google's Friend connect on each page of our main site! Give it a try, join and ask a question or answer a question! Creating a Friend Connect account (or using an existing Google profile and joining our site) is much more than just interacting on the Appliance Life website, it also allows you to interact on many other websites on the Internet. Google opened it's new technology to all developers about a month ago, and hundreds if not thousands jumped on the band wagon. incessant logging in everywhere with different usernames and passwords! Let's say that you are a guru that knows alot about repairing appliances of all types. Why would you visit our site and offer solutions and advice for our users? Marketing of course! The Google Friend Connect and Appliance Life combination allows users to add links to thier websites, post information about why they are the utmost appliance repair guy or gal and post contact information. A great way to get exposure, branding and marketing for free for all size appliance repair individuals and companies. So jump on the band wagon and join our community! Happy New Year from Appliance Life - Keep your Humidifier Functioning- CLICK HERE! Celebrating the New Year means that it is winter. ... which means "heating season" in most parts of the country. Heating season means that your humidifier should be in tip-top shape - so make sure that you stock up on humidifier maintenance items and humidifier parts. Whether you use gas or electric heat, the air from your home furnace not only keeps you warm, it will dry out the air in your home. Humidifiers, by sending small molecules of moisture into the air, can help keep you healthier but also extend the life of your furniture and other household items. The benefits of humidifiers during the heating season are many. The most common are listed below. 1. Humidifiers can help relieve cold and flu symptoms by making the air you breath moist, which helps keep your lungs more elastic and ready to fight off intruding viruses. 2. Humidifiers reduce susceptibility to infections by keeping the mucus membranes of your throat and nose soft moist allowing the tiny hairs (cilia) to work at getting rid of things like mold, pet dander and bacteria. 3. Humidifiers will relieve and prevent annoying dry, scratchy skin. 4. Humidifiers will help avoid valuable wood furniture from drying out and cracking. 5. Humidifiers will reduce static electricity, thus reducing the tiny shocks received from touching certain objects and other people. Humidifiers help you save money in doctor expenses and furniture repairs. The optimum humidity level in a house is generally 35 - 40 percent, anything above that can induce mold and may make your home feel more like a swamp. An easy way to tell if you have too much humidity in your home is to look at your windows. 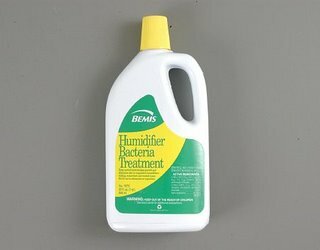 If there is moisture on the glass, cut back on your humidifier use.